Irasshaimase! The magical greeting that is very clearly heard as you enter Kinoya, a Japanese Izakaya in the heart of the plateau on St. Denis. Even pedestrians walking by the dramatically decorated restaurant jump when the waitresses and staff proudly and enthusiastically greet each and every customer. I love the warm and welcoming greeting, it makes the experience that much more authentic. I had been invited to try this Izakaya, Japanese tapas/bar food, and being a lover of Japanese food I could not resist the invitation. Walking into Kinoya is a tad bit confusing. 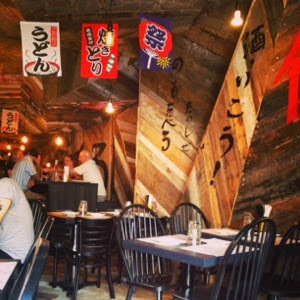 As you walk into the restaurant, the rustic wood walls take over and transport you to Japan. There are two doors and I was not sure where I should enter. A very friendly and energetic waitress greeted us with the traditional Irasshaimase, along with the rest of the staff, and asked us to walk through the first door so that she may seat us at our table. We sat right next to opened front window on a warm summer night carefully and excitingly glancing at the menu. We asked our friendly and quirky waitress how many dishes she would recommend for two people and she quickly exclaimed four to eight. I thought that was a huge gap, but she quickly explained that some dishes were served larger than others. We decided on six dishes but somehow that quickly turned to eight. The first dish to arrive was the grilled black cod marinated and served with a deliciously sweet yet savory Saikyo Miso glaze. The cod was cooked perfectly, tender and flaky. 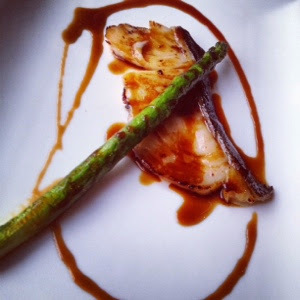 The sauce was a beautifully flavoured and paired perfectly with the delicate fish. We both loved this dish, but thought that it was very small for the price. I know that black cod is not the cheapest fish to serve, but still felt the fish portion should have been bigger especially since these dishes are made to share. 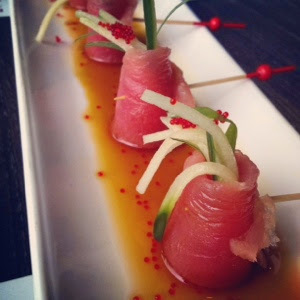 As we finished our two bites of cod, our waitress re-appeared with our second dish, red tuna wrapped around green onions and cucumbers, served with a ponzu sauce. The fish was tender and fresh, I liked how the chef served this as a play on a sushi roll. The cucumbers and green onions were the perfect filling and went perfectly with the fish and the citrusy ponzu sauce. My friend and I really liked this dish. Simple yet delicious! 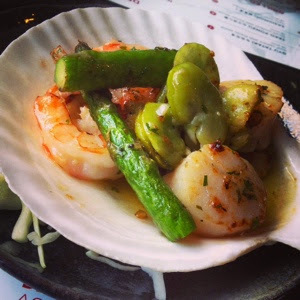 Next came one of the dishes I was most excited for; seared scallops, shrimps and mushrooms in a garlic butter sauce. The dish was served with butter beans and a spear of asparagus. The scallops were properly seared, not overcooked, as were the shrimp. I just couldn't help the fact that I thought the scallops were previously frozen, the shrimp too. They were really good and flavoured properly; I just thought them to be not as fresh as the other fish served. I could be wrong though. The mushrooms were at the bottom of the dish and had had a deep dark sear on them; it added flavour and depth to the dish. 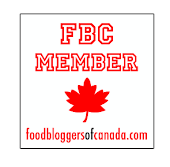 I did not like the beans, the flavour was unnecessary in my opinion. The asparagus was delicious though! We were then served the pan-fried mushrooms and cheese. When we ordered the dish, the waitress explained that instead of being melted cheese, the “cheese” element to the dish was more in the “Béchamel” sauce form. The dish arrived piping hot with enticingly delicious fumes. We dug right in and could not stop. 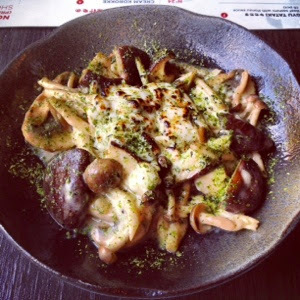 The flavour of this dish was so good; the mushrooms were tender and we loved the different varieties. The cheese was not mild in flavour, there was a slight pungent factor that I really enjoyed. 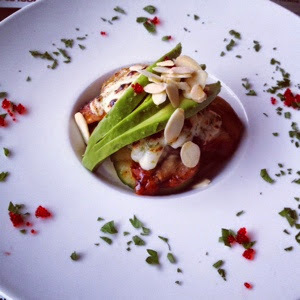 The Chef sent over his Unagi Oniyaki; eel with Yuzu sauce, almonds, mayo, tobiko and avocado slices. The dish was deliciously executed and I really enjoyed it. The flavours were sweet and savory and complimented the tender eel. I love avocado but found it was not a necessary element. The sliced almonds were a delicious touch and I really enjoyed the contrast in textures. The next dish to arrive was the Udon noodles and vegetables. This dish was very flavourful and we both enjoyed every bite. The one comment we both made was that the noodles were a tad too mushy, but the taste made up for that negative point. 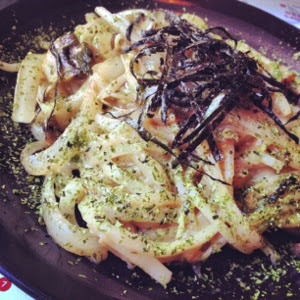 The sliced onions and bean sprouts added not only flavour but a perfect contrast in texture to the noodle dish – so good!!! The last dish, well actually we had a dish in between but I forgot to take pictures of it – shame!! The dish was a seared white tuna on a bed of rice with a Mirin and sesame oil sauce. This dish was really good. Flavours balanced well, but did not impress as much as the other dishes. The last dish we sampled was a play on sushi. 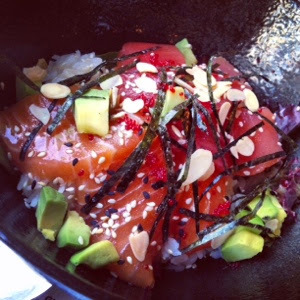 It was a bowl of rice topped with red tuna and salmon sashimi and chopped avocado. By the time we got to this dish my stomach was bursting. I still managed to eat a few really good bites before the food coma took over. The salmon and tuna were both very fresh and tasty. I enjoyed the deconstructed sushi roll feel to the dish, reminded me of my friend’s “Sushi Salad” that she had made for me the week before. 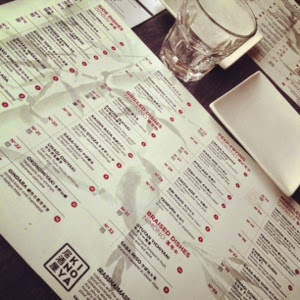 Kinoya Izakaya impressed me beyond belief. I cannot wait to go back and try their cocktails and more of what their Chef has to offer. 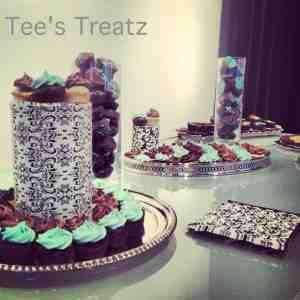 The only part I didn’t enjoy was the desserts. 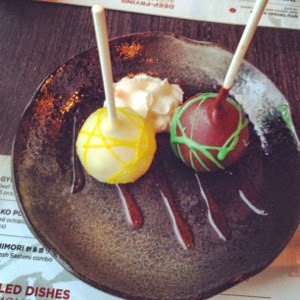 I am not a huge lover of desserts so I give myself no authority to determine a good dessert from a bad dessert, but both cake pops I was served were in my opinion were not up to par with the rest of the food served. Even with that said, our dinner at Kinoya was more than enjoyable.